Whats the best way to divert the focus from the fact that you bought her a ring thats sports teeny weeny rock. Place ring in the Euricase Multimedia Ring Box. 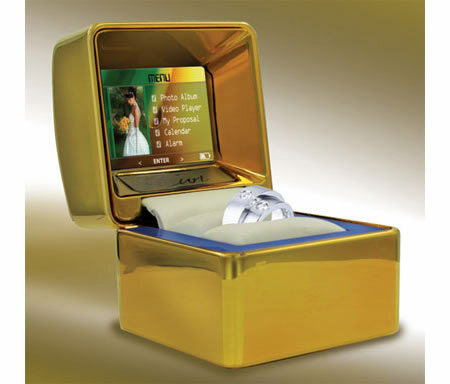 The specialty about this ring case is that it include a speaker and LCD screen where you can let her relive all those happy memories in the form of a slide show hence effectively taking her mind off the size of the rock. When she opens the case the illuminated bed reveals the ring. The LCD screen lights up to whatever recorded (please mention I love you and money isn’t everything) message you choose to personalize the case with. The memory that is included can do a slide show of upto 500 pictures or upto an hour of video. Make the most of it. The Euricase Multimedia Ring Box even has an alarm and a calender function built into it. The standard version costs $198.95 and the silver or gold plated version will cost $50 extra.